Product feature:Easy to clean, no dusting required. • Light and Privacy Control. • 100% quality inspection. • 10 year warranty. Because they’re protected between glass, Enclosed blinds retain their ‘like new’ look over time and with repeated use. They stay clean and free of damage from kids, pets, and anything else that might come into contact with your doorglass. No dusting, no tangled or dangling cords, and no crimped or dented blinds. The thermally sealed doorglass can be used in doors to meet ENERGY STAR criteria, giving you energy savings and long-term value, too. They reduce heat loss in the winter and solar heat gain in the summer. Our offering includes energy-saving Low-E glass options and impact-resistant, triple-glazed doorglass that safeguards against high winds, offers sound suppression, and reduces heat transmission. With our Light-Touch Blinds, a single-touch control lets you choose the perfect light or privacy level. 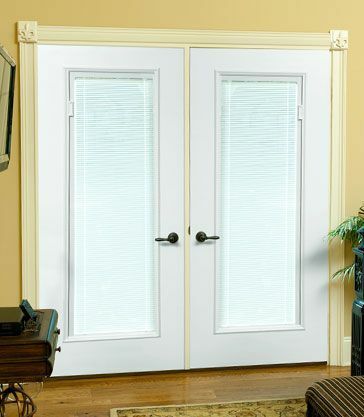 The ergonomically considered design places the fingertip control within easy reach to tilt, raise, and lower blinds the entire length of the doorglass—with only the slightest movement required. Stacked blinds disappear into the top valance when fully raised, providing a clean and uncluttered look. 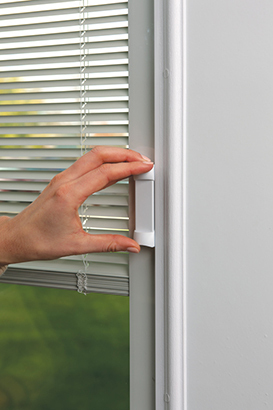 Privacy channels on each side of the doorglass eliminate light gaps when the blinds are closed—no streetlight shadows or sunlight glare.